HTC is the world-class brand of manufacturing the Android smartphones and tablets. Its smartphone catalog is world popular because of its premium design and the flawless working. 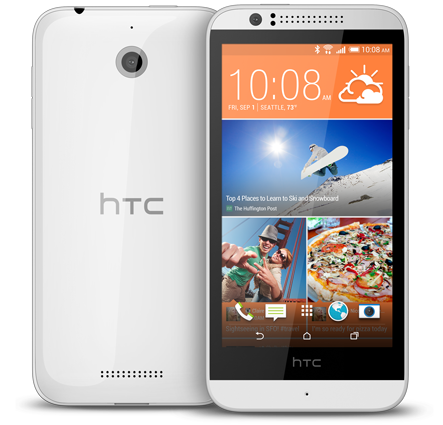 One of its mid-range devices is the HTC Desire 510, which was released, in past month. The HTC Desire 510 is placed in the catalog of the firm as one of the first midrange smartphone adopting 64-bit processor and support for 4G networks by integrating a Qualcomm Snapdragon 410 chipset. At level of computing software the new smartphone of HTC includes KitKat Android 4.4.2 with HTC Sense 5.5 graphics layer, which in turn includes the aggregator HTC BlinkFeed and many other applications and custom tools. The shell model is made of polycarbonate and has a glossy finish. The design does not vary with respect to their brethren in range, with rounded corners and very linear edges. In the top front are the main speaker and multiple light sensors and proximity. And its measurements are as 139.9 mm high and 69.8 mm wide, and a thickness of 9.99 millimeters. Regarding the weight 158 ​​grams as HTC states. On the technical side distinguish primarily a system on chip Qualcomm Snapdragon 410 quad-core processor working at 1.2 GHz with Adreno 306 GPU generation. Product of the adoption of this chip the HTC Desire 510 is compatible with 4G networks on the frequencies of 800, 1800 and 2600 MHz and offers maximum rates up to 150 Mbps downloading. The other wireless specifications complete with a WiFi connection N, Bluetooth 4.0 and assisted GPS GLONASS support. The chipset is itself accompanied by 1GB of RAM face to offer a smooth and satisfactory experience to the user. As the storage system manufacturer has included a flash memory module of 8GB, but will have available a slot for microSD cards up to 128 GB. Enough storage space to store photos up to five-megapixel resolution with main camera, and also can do the video recording in FullHD. The smartphone also has a front camera, although it is only sensor with VGA resolution. This is only disappointing thing in the phone and rest other are pretty fine. Finally, battery life of the model HTC Desire 510 is up to 17 hours in telephone conversations on 3G and up to 646 hours on standby. This is possible thanks to the existence of a removable battery lithium polymer technology and 2100 mAh capacity. Yes this year would be more interesting as HTC has set the release dates of new devices out of which the HTC One M9 is the most awaited and later we could see the HTC One M10. At present almost everything has been revealed for the HTC One M9. And it may follow the same design as of the HTC One M8, which was released last year in the march. But HTC should not repeat the design as it is; we would definitely see something new for sure.